Isla Mujeres - Looking for things to do? Check out Punta Sur! Isla Mujeres - Looking for things to do? Check out Punta Sur! Isla Mujeres: Punta Sur -Our favorite spot on the island. 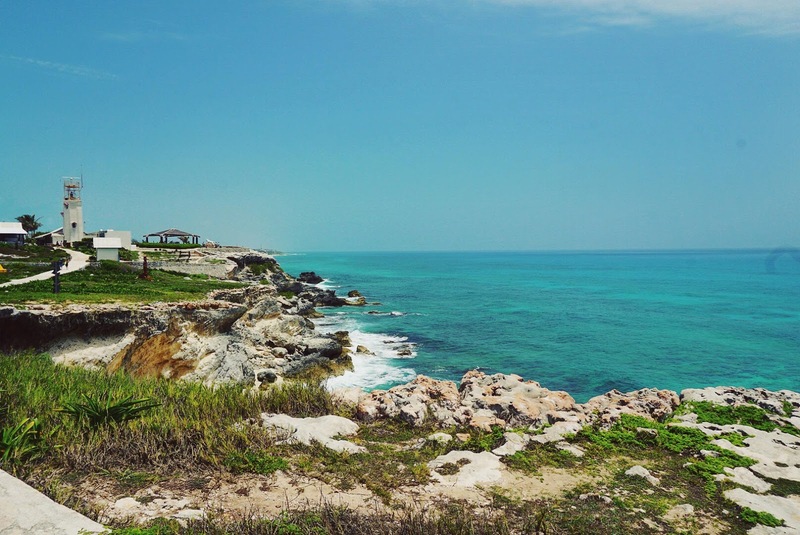 Punta Sur (south point) is hands down one of our favorite spots on Isla Mujeres. Punta Sur is the highest elevation in the Yucatan sitting just over 20 meters giving it the advantage to be the first place where sunlight touches Mexican soil. At the tip of the point stands the ancient Mayan ruin of Ixchel, The Mayan Moon Goddess. ::FYI:: Punta Sur happens to be the hottest part of the whole island, so if you go mid-day you must bring bottled water, trust us it is….HOT! Best times of the day to go would be for Sunrise or Sunset. Punta Sur not only has historical significance, but there are also many modern art installations from over 23 world artists that you can walk around and admire in the Sculpture Garden. Entrance into this “ecopark” is a mere $30 pesos (less than $2 usd) and is definitely worth it. Adventure seekers should proceed to the end of the pathway which has stairs that lead down to the ocean. There is a walkway that extends around the point on the island. Along this path you will find stunning ocean views, great photo opportunities and even the passing sea turtle or 2. This is by far the highlight of Punta Sur and Isla Mujeres. There is no better way to spend an hour of your day on Isla Mujeres. If it is your fist time to the island, then visiting this cultural icon with stunning views of the Caribbean Sea is a must see! You can get to Punta Sur easily from downtown Isla Mujeres. The best and most fun way is to rent a golf cart for the day around $50 and drive the island, look for the signs and you can’t miss it. Drive time from downtown is about 15mins depending on the speed of your golf cart. Enjoy!